One of the first skills we learn as a child is to draw. This is because creativity is part of being human. Studying art isn’t just about getting better at any one skill, like drawing or painting, it is about learning to communicate your ideas. It is about seeing what other people miss and making connections between things. A good art student can think laterally, can problem solve and really notices the world around them. At Bilborough Art Department, your teachers and technicians are all Fine Art graduates and practicing artists. We are highly skilled with excellent subject knowledge and are passionate about sharing our love for art with young people. All our students’ work here is described as Fine Art (the kind of art you would find in a gallery), because it allows them to make work using whatever materials they like, about whatever subject matter they like. We think it gives them the greatest creative freedom. Fine Art methods include: painting, drawing, graphics tablet design, sculpture, mixed-media, screenprinting, film & video, photography, installation work, textiles, stencil work and spray paint, digital art, collage, collograph, mono-print, lino & wood cut, Photoshop editing, fabric work, sewing, batik, casting, assemblage etc. So, even though we don’t run separate Graphics, Fashion or Textiles courses, many of our students make their art using those skills, and progress on to degree courses in those areas. We’ll support you in developing your own personal artistic territory. A genuine interest in visual arts and some familiarity with contemporary art is essential and you should visit galleries regularly. To study Art at Bilborough you need a grade C/4 or above in English at GCSE as well as in Art, if you have taken it. Our students achieve exceptional results, because they are as passionate about Art as we are. Why not join us? Although our students’ work is all described as Fine Art, many of our students progress on to a range of Art, Design and Craft-based degrees and careers. They are able to do this, because we specialise in teaching creative thought, as well as practical skills, and fostering creative freedom. 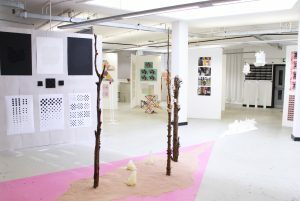 Our alumni work in varied disciplines: fine art, fashion design, curatorial practice, jewellery design, graphic design, illustration, sculpture, interior design, surface pattern design, web design, architecture, photography, textiles and game design. Our teachers are always happy to talk you through the best possible route to securing your ideal career. ART A Level is split into two components: coursework 60% and exam 40%. Students begin Component 1 (coursework) by selecting a title from a list they are given by their teachers when they first start college. They take their own photos in response to this title, research relevant artists and make work in their sketchbooks exploring their idea. This development leads towards a final piece or pieces made in whatever chosen media they wish. Students also write a 2,000 word essay about their project, explaining their ideas, techniques and artistic influences. In Component 2 (exam) students work in a very similar way to their coursework unit. This time they choose a title from an exam paper, and research and make work in response to this. In addition to their sketchbook students also make an additional 15 hour piece of art under exam conditions.